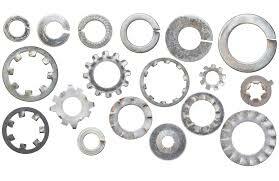 We are manufacturer & exporter of Stainless Steel , Inconel , Monel , Hastelloy , Incoloy , Titanium , Duplex , Super Duplex , Copper , Brass , Aluminium , Special Alloys Washers in following types - Plain , Spring , Star , Cone , Tapper , Tooth , Belleville . Bond Sealing. Counter Sunk Finishing. Dock . Fender. Lock . Neoprene.